It’s been one year since I bought a Zoku Quick Pop Maker. It was the start of winter here in Sydney and here I was making popsicles. Crazy. A year later, it’s the start of winter yet again and I coincidentally find myself making popsicles for the first time since about last spring. I find this a little odd. But I think I’ve worked out why I sort of subconsciously start thinking about summer things in Sydney’s winter – I’m a country girl from Indiana and I’ve spent 25 years of my life in Indiana. This time of year, to me, is the start of summer. My brain just hasn’t grabbed onto the fact that we’re in the Land Down Under now and this time of year, to Australians, naturally means the start of winter. Crazy, backward Australians! Not only is Australia a bit crazy and backwards (and upside down, as well), it’s also a bit slow. If there’s some new thing happening in the US, it takes ages for it to arrive in Australia. Take Biscoff spread, for example. And I’ve never even seen Biscoff cookies here either. In the months since I discovered Biscoff cookies and spread on other food blogs, I have yearned to know what they taste like. I understood it was similar to peanut butter in texture and usage, but what did they taste like? 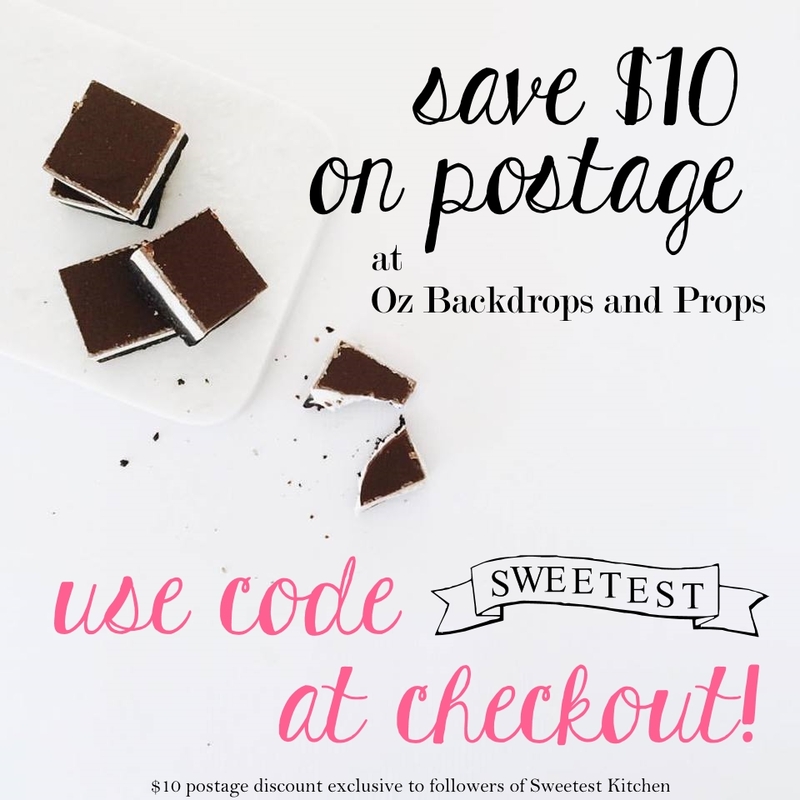 I couldn’t even find any online shop in Australia that carried these elusive foods, and online shops in the US who sold them wouldn’t ship to Australia. I believed that I was destined only to dream about what Biscoff might taste like. Luckily for me though, Kristy, a good friend of mine from Southern In-Law who lives here in Sydney, was visiting the US last month. She remembered that I wanted to try Biscoff and asked if I’d like her to bring back some back. Would I!!! She brought back two jars of creamy Biscoff spread for me and I finally had my first taste of it this past Tuesday. It was a slow tasting, as I wanted to really experience it to decide what exactly I wanted to make with it, trying to think of what other flavors might go well with it. The taste was very familiar, although I’m quite sure I’ve never eaten Biscoff cookies before. I just can’t exactly place where my memories take me when I taste it. It’s a sort of gingerbread-y flavor that I just know I’ve had somewhere before! Anyway, as I was in full swing with my Zoku, I decided to take a recipe from the Zoku recipe book for chocolate and peanut butter pops and just simply swap out the peanut butter for Biscoff. These chocolate and Biscoff-striped popsicles became my first Biscoff creation. And they were absolutely, deliciously, fantastic! The Biscoff flavor was strong and strangely warming (from the gingerbread-y spices). There’s even Biscoff in the chocolate stripes too! The Biscoff melted down really smoothly and velvety-like and resulted in a lovely, creamy-textured popsicle. If you love Biscoff and are lucky enough to have a shop near you that actually sells Biscoff, then make these popsicles right now. I ate one pop straight out of the pop maker, but it was so hard to stop at just one. I had to “claim” a second one for myself by taking a bite out of it – no one else would eat a popsicle with a bite taken out of it, so it was sure to be mine! Okay, so the bite was a bit big. Consider me a new Biscoff-addict who hasn’t yet learned to control her addiction. Perhaps there isn’t even any control to be had when it comes to Biscoff spread. Well, living in Australia will definitely restrict my Biscoff intake, so after these two jars are gone, I’ll have to quit cold turkey. Wish me luck. Until then, however, you’ll probably be seeing a few Biscoff recipes posted here! Now, everyone go get to work on these popsicles! 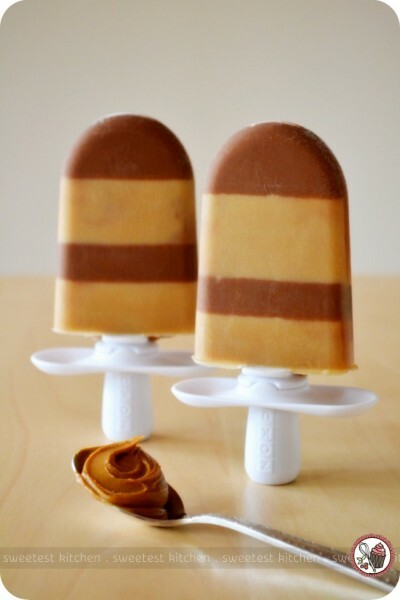 A fun, cool treat for summertime - popsicles striped with Biscoff and chocolate! Combine the ½ cup water, sugar, Biscoff, chocolate and salt in a small saucepan and place over very low heat. Whisk until the sugar, Biscoff and chocolate has melted and continue cooking and whisking over very low heat for another 5 minutes, or until most of the chocolate granules have dissolved. Remove from the heat and let cool about 10 minutes,whisking occasionally to prevent a skin from forming. Whisk in the milk, 1 teaspoon water and vinegar. Refrigerate until cool, stirring every so often. Combine the ½ cup water, sugar, Biscoff and salt in a small saucepan and place over very low heat. Whisk until the Biscoff melts down and the mixture is warm, about 5 minutes. Remove from the heat and let cool about 10 minutes, whisking occasionally to prevent a skin from forming. Whisk in the milk, 1½ teaspoons water and vinegar. Refrigerate until cool. To assemble the popsicles, place popsicle sticks into the Zoku maker and pour the cooled chocolate mixture about ¼ of the way up the molds (about 1 tablespoon per mold) and let freeze completely. Then pour the cooled Biscoff mixture halfway up the molds (again, about 1 tablespoon per mold), letting this layer freeze completely. Repeat the stripes until you reach the fill line. Ensure the popsicles are frozen, then remove them from the molds with the Super Tool. Repeat for the next 3 popsicles. If you don't have a Zoku, you can probably make these in the traditional way, but you might not want to take the time to freeze multiple layers. Maybe try just two layers instead! This is based on a chocolate and peanut butter popsicle, I've just simply swapped out the peanut butter for Biscoff. Biscoff is a little sweeter than peanut butter, so you won't need a full ¼ cup sugar in the Biscoff layer, therefore I've called for just a scant ¼ cup sugar. This means you shouldn't fill your ¼ cup measuring cup all the way to the top, but a bit under the top instead. 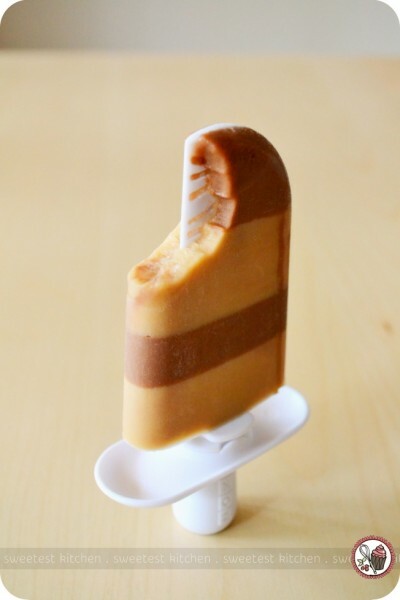 If you're making these in the Zoku, be sure to use 2% milk, as skim milk will result in an icier popsicle, and with whole milk you might find that the popsicle stick will come out, but the popsicle won't! Oh these look SO good! Hmmm, I wonder if I can’t make a gluten free version of biscoff…. I need to get googling! Before summer I think I need to get my hands on a quick pop maker! I can’t believe how quickly they freeze, the girls I nanny would love it!! 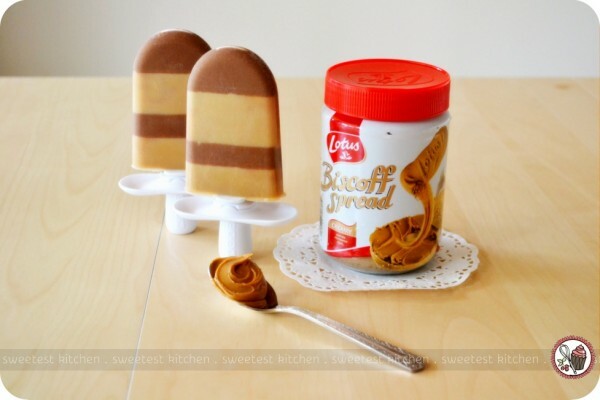 I’ve been intrigued by Biscoff and these popsicles look really fun to make! I actually found some Biscoff biscuits in my local store the other day, quite by accident! Was pleasantly surprised to see them, but no Biscoff spread. That’s an online order item, I fear! Cheers! How clever are you? I just picked up some popsicles molds and can’t wait to try these! We love Biscoff Spread AKA Cookie Butter. These look great! What does the vinegar add to the recipe? Also FYI is you have a Trader Joes near you they sell Cookie Butter in creamy and now crunchy!